The Pickup truck legend built upon more than 80 years of experience just got better. The 2018 Toyota Tacoma now for sale in Ontario is more powerful and capable than ever. With a sculpted front bumper, smooth rear deck, “TOYOTA” embossed tailgate with integrated spoiler, colour-keyed fender flares and double-wall composite cargo bed the Tacoma is more athletic and aerodynamic than ever. Body choices include Access Cab or Double Cab and a rear step bumper provides easy access to either a five-foot or six-foot cargo bed. And in response to demands from Canadian drivers, the Tacoma is standard equipped with a reinforced tailgate that locks to protect the payload. It’s easy to lift or lower, and is straightforward to remove when the payload is longer than the bed. With a choice of two engine sizes including a 3.5-litre V6, which is capable of 278 peak horsepower and up to up to 265 lb.-ft. of torque as well as the highly efficient 2.7-litre four-cylinder that delivers 159-peak horsepower and up to 180 lb.-ft. of torque the all-new Tacoma is powerful enough to overcome any obstacle that stands in its way. Both engines are built with Variable Valve Timing, electronic throttle control system with intelligence, and other features to maximize power over a wide RPM band, while also maximizing fuel efficiency. Each engine is paired with a six-speed automatic transmission with lock-up torque converter and a six-speed manual. Drivetrain choices include a 4x2 model with rear-wheel-drive and a range of 4x4 models with on-demand, one-touch 4WD featuring an auto limited slip rear differential, two-speed transfer case and automatic disconnecting differential. 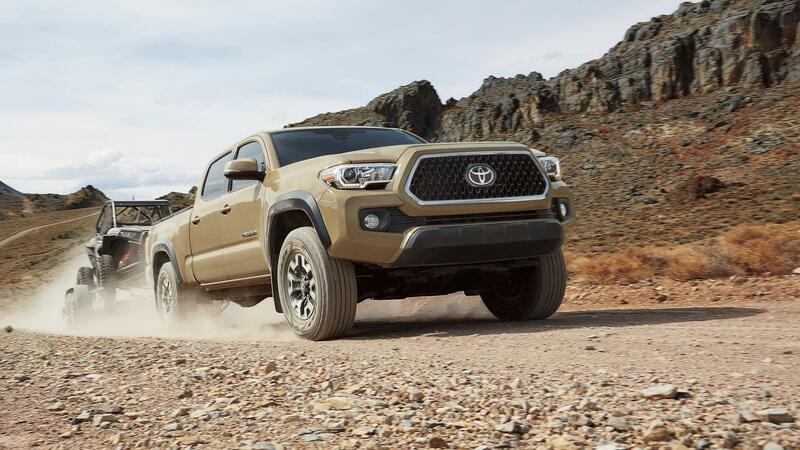 Every Tacoma also features an independent, double wishbone type front suspension with stabilizer bar, and a rear suspension built around leaf springs for confident contact between the wheels and the road – or trail. Need to tow heavy equipment or those manly toys of yours? 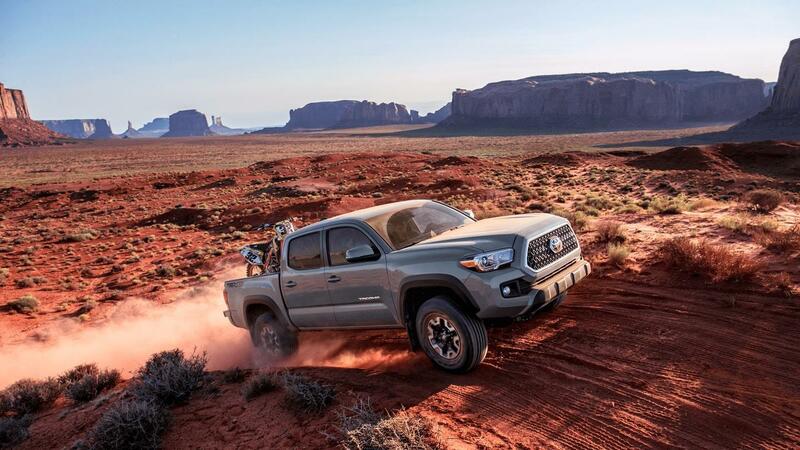 The Tacoma is the ideal truck for you. Thanks to both its powerful engine as well as a Tow Package this truck is able to tow up to 3085 kg. Regardless of cab configuration, each Tacoma model offers an interior featuring soft-touch materials to enhance comfort. Stepping up to the Limited model adds leather-trimmed seats for the ultimate in tough sophistication. The Tacoma also includes a refined and quiet cabin thanks to an advanced cab-to-bed seal, a front chin spoiler, and improved aerodynamic performance, which smooths airflow and reducing wind noise. Each model also includes rear seat versatility. Double Cab Tacoma trucks feature a 60/40 split fold down seat back and fold out seat cushions, along with under-seat storage. Access Cabs feature rear seats that fold up, offering additional, climate controlled cargo capacity. All models also offer many welcome convenience and comfort features, including a Display Audio system with advanced voice recognition, a multi-information display, keyless entry, air conditioning, power windows, map lamps, tilting/telescoping steering column, cruise control, cargo bed tie-downs and a set of four tie-down cleats, and more. The 2018 Toyota Tacoma is now available at Hometown Toyota, but this powerful pickup is going fast. Contact us today to get behind the wheel of one of the hardest working trucks available.